Once a feared pirate, now Calico Jack fights alongside Captain Jonathan Barnet against pirates that seek to wreak havoc and prey on innocent travelers. Along with the Spanish and other pirates, Jack must be on constant guard for his former and current rival Captain Charles Vanes, but how can he defeat a man that has already returned from the dead? 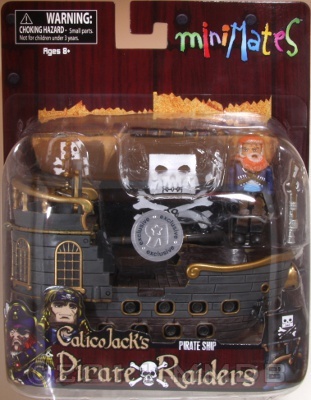 Calico Jack's feared ship is as versatile as it is deadly. Featuring a multi positional and variable mast that can be transformed to a single tall mast or even into two short mast for quicker or longer distance travel. Armed with working planks, movable cannons and storage compartments for his crew to hide in wait, this is a worthy addition to your fleet.